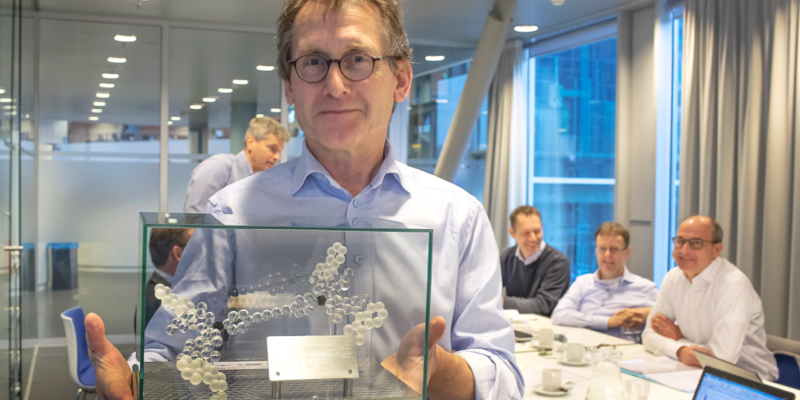 On Wednesday 23 November, Ben Feringa received a special and unique handmade gift from the Executive Board, also on behalf of the Supervisory Board, to congratulate him with to his Nobel Prize. The skillfully made glass nanomotor was especially commissioned by ARC CBBC, and made by the Utrecht University Scientific Instrumentation department. Feringa was very pleased with the gift and expressed his heartfelt thanks to the Executive and Supervisory Boards for this unique gift.